Slash has always wanted to go to school, but his father keeps him under a tight schedule that consists of photo-shoots, chinese classes, and fencing classes, leaving no time for school. He had been home-schooled for his entire life, which meant that he has never had any friends...or more accurately, he never chose his friends. Slash got ready for the morning and went downstairs to have breakfast. Sitting at the table, he turned to his father's assistant and asked if he could stop being home-schooled and start going to an actual school. "Absolutely not. It is better for you to be where I can keep an eye on you." his father said as he appeared in the doorway. "Why not? I've done everything you asked me to. At least let me go to school so that I could meet other kids like me." Slash said looking at his father with pleading eyes. "That is enough! You are not like other kids, you are my son. Finish your meal, you have a photo-shoot in an hour." the stallion's cold eyes cut into Slash before he turned away. Slash sighed and did as he was told before walking up back to his room. With a sly smile on his face, he pack what he thought was necessary for school and walked back down to the dining hall. He looked around before going into the kitchen and sneaked out of the door that lead to the back alley. "I'll be a little late, but at least I'll be going to school." he said as he started to walk. He continued down the road and stopped at a crosswalk, noticing the school is right in front of him. Slash smiled as he crossed the road, though he stopped when he heard a thud. He turned around to see an elderly pony had tripped over. "Allow me to help you." Slash lifted the stallion back onto his hooves and picked up his cane for him. He nodded to him before leaving, turning back around and hurried into the school building. ((We are on an airship that is flying to Beacon Academy. Feel free to mention some backstory or interact with other soon-to-be-team members) Slash stared out of the window of the airship as thought about the guy that he had encountered when he was shopping for dust. The man had been robbing the shop while Slash was looking at weapon magazines. He was completely unaware of it at first since he was so interested at the different weapons in the magazine. He only noticed when one of the orange-haired guy’s men tapped him on the shoulder. “Yes?” Slash asked with an unamused look in his face. “I said put your hands in the air, now!” he yelled, pointing his blade at him. The Faunus’ cat ears twitched as he asked, “Are you trying to rob me?”. The man furrowed his eyebrows and glared at Slash, “Yes!” he said with an annoyed tone. “Ah” Slash smirked as he knocked his blade out of his hand and punched him in the gut, sending him through the wall. The orange-haired man signaled another to attack Slash with a gun, but he tackled him and crashed through the window. He did a back-flip to get back on his feet as the other men looked through the broken window, watching as Slash’s orange gauntlets unfolded up to his elbow, clicking in place. He looked up at them and smirked, waiting for their next move. “Okay…” the man mumbled as he smoked on his cigar. “Get him” he said with an annoyed tone as the rest of his men charged at Slash. Slash waited for them to come closer, punching the closest one through the building and out from the other side. He stood on one hand and swung his foot across a guy’s head and used his other leg to kick anther guy from behind the legs. He jumped back onto his feet and shot the rope kunai from his right gauntlet at a tree, then pulled it off so he could use swing it and knock the rest of the men against the side of a building. Slash retracted the rope back to his weapon and turned his head towards the orange-haired man, who mumbled to himself for a while before looking at Slash, “Well cat prince, I think we can all say that it’s been an eventful evening. And as much as I’d love to stick around…” he said, pointing his cane at him, “I’m afraid this is where we part ways”. He shot an explosive bullet at Slash, but he managed to block it with his gauntlets and land back on his feet. Slash couldn't remember what happened next, something about a chasing the man, a jet and…a huntress. That’s right, a huntress had jumped in to save Slash from a dust explosion. She would've been prettier if she dropped the glasses, but she was too old for him anyways. Suddenly, they were attack by…a really powerful woman. Slash wondered what her face would've looked like if she wasn't behind the shadows, she looked quite young. Slash found himself pushed out of his comfort zone. He wasn’t used to long range battles, which was probably why all of his shots where deflected by the red lady. The woman in the red dress suddenly shot fireballs at them, “Whew, she’s feisty” he thought as the huntress continued to fight her. The woman suddenly shot a wide range attack, making the huntress take Slash’s wrist and run out of the way. The jet flew away as Slash got back onto his feet, Auralynx folding back to his wrists. “So, you’re a huntress” he said as he smirked with a half-lidded gaze, “May I take you on a date?” He soon found himself in a dark room, seated at a table while the huntress scolded him. “They were the ones who started it” he said with his unamused face. The huntress snapped some more before taking a deep breath and said “But there is someone here who wants to see you”. A well-dressed man with grey hair walked in and handed him a plate of food. “Slash Claw…” he said as he leaned toward him, “...do you know who I am?”. And that’s how he got into Beacon Academy. He turned away from the windows and rested his elbows on the rails, looking at the other new students that were on the ship. In the world of Remnant, creatures known as the "Creatures of Grimm" roam the land. Mankind had battled with the creatures of Grimm for survival since the beginning, but because of their resourcefulness, mankind had discovered 'Dust' which evened the odds against the Grimm. Since then, mankind was able to fight back and survive, using the Dust to power magical abilities and weapons. Now, young Hunters and Huntresses are trained to protect humans from the creatures of Grimm from cornering them into extinction. ------------------------------------------------------------------------------- We'll be in the city of Vale, attending Beacon Academy. We will be a team of four (i'll figure out the name once we know the characters). We'll be paired during the first test, where we will be launched into the air and land in the forest of Grimm and the first person we see will be our partner. 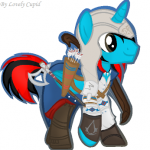 I'm not sure whether we should be ponies or humans, it seems to be weird to hold weapons with hooves. It would be handy if you know the series, somethings would be difficult to explain if you haven't watched it. Everyone would be 17. App: Name: Slash Claw Gender: Male Race: Faunus (cat ears) Appearance: Slash is quite tall and quite muscular, but does not have the body of a body builder. He has short, messy brown hair that his ears poke out of and emerald eyes. He wears brown cargo pants that are rolled up to the bottom of his knees wit a white belt and a chain hanging from the belt loop on the right side of his pants. He also wears a white T-shirt with his symbol (cutiemark) on the bottom left of his shirt and an orange plaid shirt over it. He wears sports orange and brown sneakers and wraps his hands in bandages. Weapon: Auralynx. Slash has orange gauntlets (like Yang's) that go from his wrist to his elbow. He can shoot bullets and explosive rounds from his gauntlets, they can also enhance his strength. Inside both his gauntlet, he has a rope kunai that he uses to keep his foe from escaping or to draw himself closer to things (by shooting at the ground or trees and pulling himself towards the target). When he is not in battle, it is retracted to his wrists. Fighting Style: Slash specializes in close combat, mainly boxing or kickboxing. Even without the enhancement from his gauntlets, he is really strong as one punch can sent a man several feet in the air and through a wall. Slash uses the rope kunai to maneuver around the forest, but is not as effective in a town or building. He also uses the rope kunai to pull back his foe to keep them from escaping. His gauntlets reach up to his elbows so he could block attacks with this arm. Since he is a Faunus, he also has night vision and good hearing, he is also part cat which makes him agile and acrobatic. Personality: Slash is a mischievous, aloof, and an unpredictable sort of person. Away from the public eye, he is actually very talkative and at times stupid. Although he is acts as if he doesn't care, he's actually really protective and cares about the people he knows. Even though he seems like a regular guy on the outside, he has many hidden skills and talents that he rarely speaks about because of the many different jobs he had. He also doesn't like to brag or people who do. 1: Tehengu (PyroBlaze) 2: Midnight Blossom (Shadowbolt0) 3: Andrea Indigo (DreamySunday) Hoping to get joiners! I'm so excited that i'm going to do a cover art for this!! "Are you sure they would even agree to help us?" Said the Saddle Arabian politician on one of the large screen in front Director Fury. The was four screens, each with their own figure head on the other end. "I agree with Sabimbi's curiosity." Said the politician from Long Guo. "Many of the... Ponies, you have approached haven't been very... cooperative." "I Believe I found five that i hope will see things a bit differently." Fury replied hoping to sway the politicians. "I already have one ready to deploy. But I urge you to give me some time. The avengers initiative will save more lives then any normal task force could." The politicians remained silent for a long while before finally receiving a reply from the Neighpon politician. "Fine. But the moment this little experiment, but the moment something goes wrong we will shut you down." and with that all four screens flicked off. Nick Fury let out a sigh of relief. He picked up his office phone and talked to his secretary. "Send in the agents." The door opened behind him and five ponies walked in. Among them Garrett stood ready. Fury gave each of them a folder. "These are your targets. Explain to them the situation try and get them to come peacefully. We want to be on their good side." He explained to the four of them. "Bring them back peacefully." "YES SIR!!" The five ponies said in unison before stepping out of the room. - Garret was in Canterlot. He was looking for a mare named Melody Marvel. He had no idea where to begin but he figured he start with his one lead. Her Parents. - Down in the slums of the city, Agent Lavender was scanning for Electromagnetic disturbances. Her target was a mare named Monica. - Agent Scarlet was tailing her target, A gryphon by the name of Diamond Dust. - Agent Cy was at the lab where Eilzabeth Chrysler had supposedly worked. - Agent Sun was waiting for Neria Holmes to appear. He had slipped a note into her pocket while she wasn't looking, with the address to the cafe he was sitting at. What happens when a universe has no more stories told? When it ceases to be? What happens to the characters within? Equestria is about to find out. After an eternal instant of being left in the void of nonexistance, characters from long-forgotten franchises return to make their impact on this new world. The Forgotten emerge, dazed and confused, in the Castle of the Two Sisters... --- This RP is meant to celebrate all those long forgotten video game characters, ones of a company trying to make a new franchise but ended up falling by the wayside in history. Of note would be the characters meant to become a company's mascot. There's two roles one could apply for: A pony, of course, and a Forgotten. As such, there are two forms, both similar. This is the one for pony. Name: Gender: Age: Physical Description: Cutie Mark: Personality: Small Bio: And this is the one for a Forgotten. Name: Gender: Species: Game of Origin: Physical Description: (You can put a link to an image of the character here) Abilities: Personality: Small Bio: That about covers it. You can play as both a Pony and a Forgotten, though you cannot play as two of either (except special circumstances, message me if you want to do it, and I'll hear you out first before making a judgement). I may decide to nerf your character's abilities if I find them too powerful. Here's the character I shall play, as an example. Name: Blinx Gender: Male Species: Cat Game of Origin: Blinx the Time Sweeper Physical Description: Relevant Image yes Abilities: Blinx himself has a few abilities as a platformer; He has a double-jump, can stick his claws into any surface to slow his descent, and can survive falls from great height without injury. His main powers come from his Sweeper, a combination vacuum/time manipulator. The device has six powers: Rewind, which can rewind time around him, Fast Forward, which speeds time up and gives him a one-hit absorbing shield, Pause, which pauses time, Record, which creates an invulnerable duplicate for a short time, Slow, which slows down time, and Reset, which activates upon injury and rewinds him to a previous point. These abilities are powered by time crystals, but as there are none in Equestria, he cannot recharge them. He has only one use of each ability, except for Reset, where he has three. The magic in Equestria also messed up his time manipulation abilities; While it will still work on inanimate objects in the nearby area, living beings are pulled into his power and thus are unaffected. The Sweeper is also able to use dimension-scaling to take in objects as big as he is without damaging it, and then shooting it out at a high speed. His sweeper can hold up to five onjects. Personality: Blinx is a very determined cat. He has a strong sense of justice, and will always rush in to right a wrong. However, he does not think ahead, and can get himself into dangerous situations very quickly. He does not come up with plans, preferring to think on his feet. He has a habit of keeping his sweeper full of potential projectiles at all time. Small Bio: Blinx is a Time Sweeper, a sort of temporal janitor. His race has mastered time and space manipulation, and goes into other universes in order to clean up glitches in the time matrix, which manifest as crystals. If the crystals remain too long, the time matrix becomes unbalanced, and monsters are formed. If it gets too imbalanced, the matrix will collapse and the universe will be destroyed. Blinx has seen his fair share of worlds, but while he wants to make a name for himself, he just continues on with his day-to-day life. Hello darlings, anyone up for a little bit of casual rp? This one is going to be very simple, and I had it in my mind for a while: A character having a bit of conversation with an older-generation self as the two is forced to spend some time together for specific reasons (terrible weather, waiting at a bus stop, depends on the character). This will be a pretty adaptive RP for me, darlings since I have a lot of characters I'm interested in seeing this happening. However, there are rules. 1. Canon only. As it was obvious from the title. Sorry OC players, maybe next time. 2. Be respectful. Please don't just join to make Pinkie Pie an axe-crazy murderer so she can kill her old self because you don't like it. 3. Please keep it at narrative. 3rd person or 1st, but the more detail you put into your response, the better. Take it as collaborative fanfiction writing, darling. Characters I can RP with: - G3 Rainbow Dash (pre-core7) - G3 Rarity - G3 Pinkie Pie (pre-core7) - G3 Fluttershy If you're interested in a bit of a crossover challenge note me with the character of your choice. I'll take a look at the responses tomorrow morning and if there are more people willing to accept it, which I doubt, I'll notify the winner. Excuse me if I'm being a bit too strict, darlings, I'm new to this forum-based roleplaying myself. Based on the anime "Log Horizon", but with ponies., if you couldn't guess. Rules: You are not a member the Debauchery Tea Party, a guild member, or anything with high-fame. This is to stop you from yapping about your fame and suddenly having your guild give you things. Please be reasonable. You are not a level 100 (as of new expansion) who has run Tartarus five times without breaking a sweat. At highest, I suggest you're level 70 with a reasonable skillset of your liking, and some appropriate gear. OCs only. Even the game here has OCs only. Please, for Celestia's sake, write at the minimum the equivalent of a paragraph, or something with substance. I will and do not tolerate one liners. The world is pretty much this map (non-official as to relate to an entire world, rather than a region). Keep a posting order, so that when it comes to your turn, you will have much to write about. Only interject when you need to. I will control major monsters and NPCs. With an iron hoof. Have fun! On with the show: Elder Tale. The hit mmo played throughout the entire world. Using the Half-Gaia Project, the world as we knew it, was replicated in half-scale, providing a large world area, where just playing in a different region meant encountering different cultures and lore. With a variety of roles to play, and a large world to explore, it was a game which was easy to play, but hard to master. Over the years since Elder Tale had entered beta, many guilds have risen and fallen, milestones conquered, and legends forged among the community. When the show My Little Pony: Friendship is Magic, and the following "Brony" community came out, it was no surprise that Elder Tale would be in some way intertwined with the show. First came the increasing players, then, a group of expert programmers managed to take the core mechanics of the game, and add ponies into it. The Half-Equestria world which resulted from this. With the help of the community's many talented artists, writers, and modellers, a world is created that merges the best of both My Little Pony: Friendship is Magic and Elder Tale. Renamed Equestria Tale, the game was easy embraced by veterans to the original game, and new players within the brony community. With multiple expansions every season of the show, the latest major one, Return to Canterlot, saw an explosion of content from Season four. But when users logged in after the update, they found themselves trapped. 30,000 players found themselves trapped within the world, within their ponysonas. Now, they must thrive and adapt to their new world, in the hopes that they will be able to return to the real world, somehow. ... Wha-... Where am I? His eyes opened to a blurry sight with some light glaring into his eyes. As they adjusted to the new world, he noticed that it was green. Vines, bushes, grass, and old abandoned buildings. There were some smaller houses, but those seemed to be different, as they were made of wood, and had a less modern feel to it. Ponies walked around minding their own businesses, but then there were some who also seemed to have just come to. Getting up on his two- Wait, four!? Lifting his hands, he could see that they were hooves. Looking down at himself, he could see that he had the body of a pony. What happened? Why am I my Ponysona from Pony Tale? Thinking back, he remembered that he had just woken up that day to download the latest expansion for Pony Tale, an bootleg adaptation of Elder Tale. With Ponies. The last thing he remembered was selecting his main character, Warp Sign, and that was it. Getting up on his... hooves was disorienting at first. But after a few tries, he managed a small walk. Accidentally gesturing with his hoof, he opened up his menu. Selecting his stats screen, it was time to refresh on his skills. He was a Summoner that specialized as a Elementalist, embracing his favourite element of fire. Level 50, low HP, high Mana, large assortment of ready to use offensive spells. Alchemy, and some pretty impressive gear. Checking the friends list, he saw some on, but most were off. Sighing, he managed to walk into a large open area. The square in front of the Guild Building! Players, just like Warp Sign, were voicing their outrage and anger at their situation, while others were dreaded and were saddened by their predicament. But Warp Sign did not interact with that crowd. Instead of being irrational, and treating the situation like a doomsday situation, it was better to figure out how to escape. Unfortunately, his knowledge from books was limited, being more an alchemist, rather than a scribe. For now, his solution, was to just sit and wait, until either one of his friends messaged him, or the crowd dispersed, and someone was ready to take charge and move the group into a more productive state. "Ridiculous. Aren't we, before we called this a game, but now, we run scared." He muttered to himself, and turned and began walking towards one of the Pony of land inns, where he could get out of the bigger crowds for a while,and maybe pick up one or two things as he found out what was going on. The Boneyard; ruins of Los Celestis, Equestria's largest city (in terms of area, anyway); and one among many places hit hard during the war. For over Two Hundred years the Boneyard lay silent, the wind flowing through the derelict streets, Mother Nature, or at least the brutal, twisted spawn of what could once be considered such, roaming the streets unchecked. Not all had perished during the war, no; many had made it to the safety of Stables in and around the sprawling city. Whether it be due to the nature of the Stables, or rubble from ruined buildings blocking out the entrances; many of the ponies who were supposed to have been spared the horrors of Megaspells met their ends, some more gruesome than others. Still; throughout it all Pony-Kind had learned to adapt to their new world, to survive in a harsh, unforgiving Wasteland of radiation, mutations, and old-world secrets, some of which many believed should stay buried. Some, however, began to question their fears of the old world, pondering the possibilities of going beyond simply surviving, and perhaps; thriving. It all began to take off several years ago; rumors of a brave adventurer far to the East conquering many powerful foes and some even claim the Unicorn Mare to have been responsible for lifting the cloud cover over Equestria. Still; as the world began to heal some, the many tribes were graced with a new gift from the old world. A vault from the heart of the Boneyard had opened; its residents braving the creatures that had taken up residence in the once-lively and prosperous city to bring to the Tribals something worth more than all the caps in the world. Nestled under the Great Library; Stable 47 had been a shelter for intellectuals and a safe-haven for knowledge; a bright young Filly seeing through the lies of their Stable-Tech appointed lineage of Overseer's and rally the residents around her; the Dwellers revolting and overwhelming the Overseer and her Security Division, before the survivors of the violence took their first steps into the outside world. Those who lived through the Revolt and their Exodus from their former home found themselves in the company of friendly and peaceful tribals; primitive ponies whose limited knowledge of the world before had gotten them so far. Contact and communication, however, began to open up a whole new world for the survivors of the War and subsequent centuries. Ancient methods of Agriculture and Industry were re-introduced. Crops now produced a significant excess of food due to Crop Rotation, Advanced Irrigation, and the re-introduction of tools. The later in the same year after coming into contact with the Stable 47 Ponies; the tribals found use for an old Iron Workshop on the outskirts of the city; industry re-introduced with the repairing of the barely-functional smelter and Forge. Now, with a place to melt down their Scrap-Metal and re-cast it into tools, the Tribals lives improved significantly. Next came structure and order. Initially a Democracy; the ever-growing Tribes bound themselves together as one great state; united under the strong Hoof of a Monarch. The Idealistic, youthful ponies among the Learned community had pushed the people in favor of a Federal Monarchy; in which member-states retained their own form of self-government, which ultimately answered to one higher symbol of Political Authority. Embracing the Ideals of Enlightenment and meeting the desires of the people halfway with the need for a strong, centralized state; it was agreed that one Pony would serve as Princess, the highest form of Political Authority in the growing state of New Equestria, with reasonable limitations to her power, though unrivaled and undisputed head of state and all matters, domestic and foreign. Sadly; peace does not last forever. Jealous of the great wealth and Prosperity the united Tribes had worked so long and hard for; aggressive tribes of ponies set themselves to raiding and pillaging; terrorizing the peaceful farming communities that made up a vast majority of the new Principality's territory. Taking it upon themselves to resolve this; the leaders of the Principality had their scouts and scavengers scour the inner city; coming upon an old Munitions Factory a reasonable distance within city limits. Evicting the mutated tenants of the factory; the new State began to produce weapons of war, calling upon the intelligentsia once more for their access to pre-war knowledge, which had helped so much before. Military Doctrines were uncovered; from successful generals across all the Pre-War periods recorded in pony history. The West watched as the first organized and professional Army the region has seen in years marched through the gates of the Princess' Citadel in the outer Boneyard, straight into the territory of the Hostile tribes. Through their superior training, discipline, and firepower; the Monarchy put down several tribes of raiders; their tribespeople forced to either flee or integrate. Spirits soared high; a Golden Age descended upon the Ponies of the far Western holdings of the old Principality of Equestria. A new state; using the past as its foundation upon which to build anew. This state had only begin to transcend their dark age, however; despite intensive reforms in Education and Industry, many ponies remained uneducated, and the wastes were a dangerous place, if not because of the mutated flora and fauna, then due to their fellow Ponies as well. Many among the Intelligentsia, who had saved these ponies time and time again, would surely exploit their incompetence, were it not for the Princess, the Benevolent Princess Golden Dawn; head of state and ruler of all territories within New Equestria. Under her guidance; the Intelligentsia has been kept from exploiting the Tribals, who have only just begun to see the light. As a result of her Meritocratic Policies, which have prevented many an entitled Stable-Dweller from attaining the prestigious rank of Nobility; the Princess has made many enemies within her state already, and now it seems; newcomers encroach on their lands, whose intentions may not be in the best interests of the people. The New Canterlot Republic; looking to expand its wealth and influence through the reconstruction of Equestria. An admirable and similar goal, though they are guided under the Political Ideology of a Republic; "by the ponies, for the ponies". They lack a traditional Head of State, instead relying upon an elected Senate of representatives from the common population to guide them to prosperity; giving the commoners a greater sense of entitlement and control over the system. The Steel Rangers; dedicated to pre-war technology, finding it and preserving it no matter what the costs. Their distrust of outsiders with the safe use of Pre-War tech, chiefly weapons, has led to open confrontation with the NCR, and a subsequent rift in the order known as Applejack's Rangers; an organization dedicated to preserving pre-war tech so that it might be used to help Equestria rebuild and flourish. Alicorns; strange beasts previously unseen and unheard of, forced West in the wake of the Goddess' destruction. Some seem genuinely helpful, others malicious, and others still completely insane, having lost their minds due to having spent so much time as part of the Unity before, now incapable of coping with the silencing of their dear Goddess' voice. And alas; not all is perfect within the Kingdom itself. The Intelligentsia has become drunk with success; many becoming greedy and entitled, believing they should not waste any more time on the simpleton ponies now so eagerly wrapped around their hooves, but rather; use them to expand, be it out into the wastes or further into the Boneyard. Still; the Military's loyalty and Citizenry's great approval of Golden Dawn keeps them at bay, for the time being. While the vast majority of the Intelligentsia schemes and broods over Golden Dawn's perceived weakness; the Citizenry faces its own issues as well. Many are very well aware Zebra's were responsible for dropping the first bombs which condemned Equestria to its doom centuries ago, and continue to harbor a deep hatred for the race. Gryphons are treated little better; perceived as aggressive and generally obnoxious by the Ponies of New Equestria; old cultural differences continue to cause a rift between the Pony Majority and what few Gryphons live in New Equestria. Racial tensions are nowhere near as high between Ponies as Gryphons as they are with Zebra's, though; yet no records exist indicating the Gryphon Kingdoms did anything to help Equestria in its time of need, seen by many and cause enough for suspicion at the least, and for a few, as justification for discrimination. Finally; Religious Zeal proves itself a rather minor and annoying issue in the New Principality. In the wake of the war; many in the Tribes that formed afterwards turned to their faith that the Princess' would always watch over them, even without their mortal forms to tie them to this world. This conflicts with the Secular Intelligentsia, which believes that even though the Princess' once lived and ruled the affairs of mere mortals; their mortality was proven by the war, marking an end of their time and the beginning of a new age when Ponies must instead rely upon each other, rather than promises that long-dead Goddess' would do anything to help them. This in and of itself had caused internal strife between the devout and the Intelligentsia, though such tensions as of late have been directed outwards, at Alicorns; labeled by the more Zealous as horrid abominations; testaments to the hubris of those who came before, contributing to the divine punishment sent down to purge the world of sin so that the true believers may start anew under the tender embrace of Celestia's divine Sun and the peaceful respite of Luna's holy Moon. Even through all this; many strong figures of authority and loyal believers of their Nation's values exist within the growing Principality. One such Pony, a Cavalier by the name of Crossfire, leads the Princess' Elite force of soldiers; trained and armed beyond the best of the Royal Guard, and the most educated individuals, be they of Tribal or Stable-Dweller descent. The young Mare has proven herself quite capable time and time again in training; her recently-obtained Cutie-Mark pertaining to Marksmanship and ability with Pistols, her skills and ability to learn quickly earning her rapid promotion among the ranks of the Cavaliers. Young Crossfire had even impressed her Majesty during an inspection; her lightning-fast reflexes and tact giving her an edge over most others among the Cavaliers. Rumor's have it the Princess has her eye on Crossfire as an heir to the throne of the aging Monarch, whose health has been failing as of late. Such rumors, however, are only half-truths. While Her Majesty may very well intend for Crossfire to take the reins of leadership; even the highly-talented young mare has her flaws. Being Socially Reclusive is the first among many such traits; her incapability of sitting through small-talk and avoidance of large crowds in favor of isolation a matter of concern for her superiors. Still; her open-minded was has allowed for some improvement; interaction with fellow Cavaliers providing some hope that maybe someday, she could overcome such issues. In the meantime, however; the Cavaliers had more important matters to concern themselves with; to establish contact between the Principality and these encroaching Ponies; to observe and report, so that they might know who to consider friends and who to consider Enemies... --- Crossfire stood alone on a ridge overlooking a small encampment. This was the first signs of life she'd seen this far from the borders since the scouts reported the presence of strange new ponies, and it did not bode well at all. Smoke rose from the encampment below; obvious signs of a struggle, which it seemed these newcomers had lost. "Raiders, you think?" An Earth Pony Stallion asked, stepping beside his Lieutenant and gazing over the edge of the slope. "Possibly... Sir." The much smaller Pegasus Mare replied, caught between her thoughts and reality. "Hmm... Let's get moving, then. Everypony; keep low and move fast, there might be survivors in need of our assistance." The captain of the small entourage said, the others complying and moving quickly. Crossfire joined her comrades and they descended the slope towards the flatlands below; keeping an eye and ear out for danger. They approached the burnt tents; some still smoldering in the mid-morning breeze. A banner sat amidst the carnage; too burnt-out for them to recognize, but still. If there were any survivors in this mess; they would have surely recognized the Cavaliers by now. Their dusty, brown Uniforms reinforced with leather armor gave them away as more than just Raiders, as did the Coat-of-Arms of Celestia's Pre-War Monarchy that was woven onto the shoulders of the Uniform. The Cavaliers picked through the wreckage; looking for anything useful to salvage, or anypony still alive. Eventually, Crossfire came upon a collapsed tent, which moved slightly as she passed. Without hesitation, she drew a pistol and aimed it at the figure now outlined within the tent, admittedly taken by surprise by the sudden, unannounced presence. "Identify yourself!" She exclaimed, watching as the figure beneath the tent froze, prompting her to switch her safety off, staring the figure right where its eyes would be, were they not currently covered. Please read the IC, http://www.canterlot...e-legend-ic-18/ , to know what this Rp will be like and to give you a back story of Equestria at this time. Due to the nature of having the slay mythical and fictional creatures..this RP will take place in the 18+ section. Basically if you can handle killing a goblin in LoZ then you can handle the amount of violence in this RP. Accepted Characters: Grouse - Brony55 Xan - Pyro Blaze Spirit - Sleeps Quick summary. This is a crossover based off of Legend of Zelda. With a combination of Wind Waker and Ocarina of Time. Wind waker for the use of instruments and the prophecy parts. And Ocarina of Time for the terrain and way Equestria will look. It is a time set WAY back. Quick places to remember: Canterlot - Home of the Royal Family and an iconic city. The King of Equestria resides here. City is a major trade center. Everfree Forest Village - This is where our heroes will be in the beginning. No exceptions. A very heavily secluded forest village that is inhabited by only foals. It is said the village is only visible to other foals as well. It is protected by a ruler who resides in the Temple connected to the village. Canterlot Lake - This lake is home to one of the Royal Family's closest allies. The Hippocampi. Sea like ponies that have built their villages under the deep lake waters. They are in charge of fresh water to all of Equestria. Gudara Desert - This is the home of all those that are banished from Canterlot and its surrounding areas. This is also where our "Ganondorf" Or Sombra in this case will arrive from. The desert is an extremely harsh place and often the ones banished..find a tough fate. But not Sombra. He has a special power none of the other banished creatures have. His prophecy is set in stone and he is proud to say that he will seek that prophecy out. Griffon Kingdom - The griffons have a new budding relationship with the Royals. They usually stay high up in the mountains and don't visit much. But they are beginning to open up. They are also governed by a king. The Sky Temple - This floating fortress is said to be the home of those worthy enough to reach it. Though the place is Pegasus only. It is home to a proud group of Pegasi known as the Valen. They keep to themselves and start no quarrels. There are a few surrounding towns that I may call on by name if we pass through them . Okay! Now for the character sheets: Name: Your name please. What name has been inscribed in the ancient tablets? Age: Foal. This is locked at Foal. Do not change it. Species: Coat and Mane/Tail colors and styles: What did the ancient tablets show you looking like? Residence: Again locked at Everfree Forest. Do not change Cutie Mark: No cutie mark yet. This ties into the prophecy as well. Musical Instrument you play: What did the ancient tablets show you playing? Be it flute? Or be it six strings? Fighting style: Just for fun. No big detail here, are you a secluded fighter or do you rush on it? Occupation: What do you do around the Everfree Village? Your job may depict what items are acquired to you on the journey Spirit Animal: This will be used for the first temple and many other things to come so pick wisely. Also, only one of each animal please, don't want all of you being the same animal. And here is the big one: What element are you prophesied to be? Elements are first come first serve! Do not worry! No other Hero will be any amount of overpowered than the other heroes. A Hero can only use his/her elemental powers when all the other elemental Heroes are present. Or with your linking element. The tablets show: A Hero of Fire A Hero of Water A Hero of the Sky A Hero of Time Sorry this one is mine A Hero of Light ---------------------------- Here is my Application that I will be using in the RP: Name: Aquilan Age: Foal Species: Earth Pony Coat andMane/Tail colors and Styles: His coat is a light blue color. His mane and tail are a light blonde and both are short. His mane falls just above his eyes and is swept to the side as well. Residence: Everfree Village Cutie Mark: No cutie mark Musical Instrument: Aquilan has grown fond of the lyre he made for himself. He likes to think of himself as the best around but he is alright at it. Fighting Style: Though the only fighting he has ever done was fighting back giant spiders or timberwolves he doesn't fight that much. But Aquilan is fond of using a sword and shield like most ponies. The shield he uses has a strap that he wraps around his left front hoof and when he fights he can hold it up to block and still have three hooves to move. He usually keeps his sword in his mouth when it is necessary to use it. Occupation: Aquilan worked as one of the scouts in the village. He would keep watch over the small settlement and guard the only entrance to the location of their village. Though he is sure nothing bad will ever happen he stands ready and guards the village. Spirit Animal: Only once did had he entered the sacred Everfree Temple that their protector was said to reside in. It was a pretty much one year ago, all the foals of the village had to go inside by themselves at some point. Aquilan entered and did the ceremony and found out it was nothing but a time for the protector to tell you your spirit animal. Aquilan was told he was a Wolf in the spirit animal world. Personally he thought the ceremony was dumb. He would never need to remember this stuff. Hero to be: Though he doesn't know it yet Aquilan is said to be the Hero of Time. Following along the other heroes in the same prophecy as he. This was created in photoshop CS6, created in around 2 hours. © May use the image while not claiming as own. "Oh, come on, Odo! Shince when have I ever put anyone but myself in harm's way?" "This week? You nearly got Rom fried fixing the holosuites, your so-called 'replicator failures' put three of your customers in Sickbay, you left one of your Dabo girls facing two angry Klingons by herself, and your attempts to use Nog for duterium smuggling nearly ended his career with Starfleet." "Simply accidents, Odo! I never put anyone in thoshe situations. They simply happened." "Yes, I'm sure you tell yourself that so often you might almost believe it." "...You stiiiiiill don't trust me, do you, Odo? Here I go, putting forward my own reshources, my time, my help forw-" "Rom's help, you mean." "-a... Rom's help... Paid for out of my own profits, I'll have you know! I give and I give trying to show you that I want to help your efforts with security, and here I am, met with borderline hoshtility! I honeshtly don't know why I bother." "Pfuh! For all I know, this is no more than some ploy to get rid of me. Again." "Ah, now that is where you're ghenuinely wrong. See, without you, I'd have bigger problems. Captain Sishko would put in a new Chief of Security, and the way things are going, whell! I'd either be stuck with Commander Worf, or worse still, the Major. And they wouldn't come to undershtandings the way you and I do, ho ho ho hoooo, no. The words 'better the devil you know' apply." "And which rule of acquisition is that?" "It's a hew-mahn proverb, actually. Though, it roughly correlates with Rule of Acquisition one-hundred and eighty four. Loses something in the translation, though." "I'm supposed to believe that?" "...Well, no. Which is why I have had this device inspected by none less than Chief O'Brian himself. Go ahead! Ask him what this device does, he'll tell you exactly what I've told you - a pershonal teleporter. Works anywhere on the stashion - regardlessh, mind you, of whether the stashion's teleporters are operational or not. Could be ver-ry handy in... shertian situashions." "Humph! We'll see about that." And then, much to his chagrin, Odo had actually tried out the device. Not on the spot, of course - he'd double-checked with O'Brian first. He had no intention of taking Quark's word for anything. But, for the sake of being thorough, he'd attempted to use the teleporter to get from his office to his quarters. Instead, he was on a particularly bright, rather clement planet, not far from some sort of indiginous settlement. Not that he knew it, but Constable Odo'ital was standing just outside of Ponyville, and despite his efforts with the troublesome device, he wasn't going anywhere else. It's actually a rather nice summer day, all told - a few clouds dot the skyline, a light breeze offers some measure of relapse to those working themselves hardest on such a fine august day. A few songbirds tittered and chirped in the trees, calling to one-another as to who might call which particular tree their territory. It only gave the six-foot-tall, somewhat clay-faced humanoid in a full-body beige security outfit more contrast to his vivid surroundings - for now, he did not so much 'blend in' as he did 'stick out like a sore thumb'. Though, frankly, given that the majority of equestrians lack thumbs, this expression might not be so particularly apt. There was a moment of pondering, a glance up into the sky, and then Odo hissed a single word, his tone infuriated beyond his usual range of emotion. "Quaaaaarrrrk!" But, the question remained - who would find the wayward changeling? Premise and setting A small concept I thought up of. over the past few days of playing. Imagining what might happen if Equestria treated the Changelings as complete aliens, and how they would combat the threat. I would like to take a moment to say that there will be tons of headcannon, and tons of explanations that may not follow your thoughts, but my ruling is final on this matter. The Technology level, is quite sporadic. The most advanced weapon a pony has with them, is a pre-WW1 to WW1 Rifle (Ie, Springfield, . No shotguns, no semi-auto pistols at this point (revolvers up to the rifle era-range are permitted). Other than that, crossbows, bows and their associated variants, swords, assorted melee arms, and matchlocks, and flintlocks are available for use. Note that I don't like anyone having anything bigger than a personal weapon, so no big cannons, not "suddenly portable Gatling guns". Magic-based weapons must be cleared through me. Use of a pre-WW1 to WW1 rifle must be cleared through me. Aside from that, armour is still primitive, metal platings, or leather gear. And at this point there is nothing else. To to TLDR Tech level: Pre-WW1 to WW1 rifle is highest permitted. No Semi-Auto pistols, no MGs, No Gatling guns, no cannons of any size. Revolvers, flint/match lock firearms are fair game. As well as swords, and assorted stringed bow weapons. Armour is still Leather and metal. Magic-based arms are usable at my discretion. Advancement of the roleplay depends on how the players perform. Changelings that are brought back from the field are usually autopsied (if dead), or interrogated (if alive), just like in the game. It takes time to research and develop the new improvements, and that time will progress as while the agents are in field. The end result of the team influences what the Changelings do next, so care must be taken to not make things too much to handle. So recap: Moving the RP onwards is solely dependant on how the Players act. You can mess up, and cause the Changelings to be bold and deadly, or you can annihilate the attacking force. You can bring back tons of the dead for autopsies, or you can capture the living to interrogate. (Nb, Interrogation not available from the start, you need the tech to bring them back without an Changeling army assaulting XCOM HQ) Speaking of which, an "agent" is the character you use to join. When it comes time to make that application for him, he must seem "unique", special, and somepony that might be considered for a black-project that involves the fate of Equestria. That means, no one-liners, no short stops ("He shot the Changeling" is much much different compared to "He took aim at the Changeling's body, and fired a single shot at it"), and I will say it now, An stat system will be implemented to make it easier to compare and determine capabilities of the Changelings and the Agents (eg. Autopsy on Changeling can reveal certain stats about it). On a scale of one to 7, 3 being the average for all ponies, 1 meaning the pony is subpar in that stat, and 7 meaning it's exceptional in the stat. Strength: Self Explanatory. Applies to doing anything with physical force required. Endurance: Also Self Explanatory. A gauge for how many hits you can last. Thought you cannot die (unless you want to), the worst you will get is into a critical condition. Agility: Gauges two things, How far and fast you can run, and how well you are able to respond to enemy attacks. Dexterity: How good you are with making your weapon "dance" (in other words, how fast that sword can move, or how accurate that gun is). A gauge of accuracy if you will. (How hard you hit and if you hit at all are different) Will: For non-unicorns, it shows how much you can take before pressure sets in and you break. Also shows susceptibility to mind-magic. For Unicorns, it also determines how strong their magic is. Every Agent has 15 points to assign (4 on all for a "jack of trades, master of none" ). Everypony comes with a free point in all stats (because of your trained backgrounds). Your stat should reflect your backstory, character's physique, and Cutie Mark ability. Changelings will perform many actions that irk the ponies in XCOM, and the Royal Family. Ever since they beefed up their own screening, it has become easier to detect and identify whenever Changelings are on the move. Now that they are bolder, they tend to abduct ponies from towns, conduct terror campaigns, etc. Not to mention they have adapted multiple forms that are appropriate for their function and purpose while on the field (yes, expect big, hulking Changelings with giant claws). Changelings also have their purpose-built awesome magic that's dangerous. I will randomly decide whichever one of these is happening. The course of one activity shouldn't take many posts... if everyone does it with much detail. Otherwise things will go on for longer. I will give brief rest times inside XCOM HQ to RP you character's outside of battle, as they will also serve as a counter for developing/creating equipment and items. Test Character Sheet I welcome any comments, suggestions, and interest in this roleplay. Do keep in mind that this is basic framework, I will expand it more as I think of more. This is to be new Fallout Equestria Hub thread. We're all of us FoE role players and enthusiast come to talk about the wasteland we love so much. Here is the place to tell us about your FoE rps and perhaps tell us your ideas for an rp so they we can work on making it a reality. This is the place for idle chatter the world in general. ----------- The first thing I'd like to announce is that I'm working on the idea for a FoE rp using elements from Elizabeth Bathory's history and vampires and Mixing with some super science into the story. Warning! Although this RP is to have no Sexual/Excessive Violence/Other inappropriate things/Drugs, This rp concept still has some Mature elements. If you're uncomfortable with the heavy lack of friendship (mostly), tons of guns blazing, and tons of lawbreaking, and tons of other usual unsavoury content usual of an , retreat from this thread now. If you are also uncomfortable with me having absolute and final decision about the actions that occur in response to your actions, please also leave. Equestria, Canterlot. 2075. You walk by the bar as you do your daily rounds. Between the risk of getting mugged or geeked in broad daylight, and getting caught up in rain, your chances of lasting the harsh conditions of the neighbourhood lower each day. You lost your gun to some gangers running protection rackets. Your eyes shift in paranoia as you round the corner, more alert than even a cornered beast. You are prey, and underling of society, slightly above you is the predators, the gangs, the random strangers, and even further up, are the corporations. Superseding even local government and the Royal Court, their ground was extraterritorial, the laws of the city became irrelevant. But those were the good days. Now, you're stuck in a dump, surrounded by the filth of society. Under normal circumstance, you would've been geeked, and faded into dust. But no, you are more than that. You are a survivor, you are a legend among commoners. Albit unsung and under-appreciated, you talent's are sought after by various employers, and your exploits are legend. As you finish reminiscing, you stand infront of a door, looking up at the sign. Coming to a familiar place lifts the spirits inside, as you enter and walk down the stairs, you're greeted by familiar faces. Though you ideas for "fighting the good fight" conflict, you all see friendly faces. For the time being of course. Most are motivated by the tons of bits. You nod your head and find your locker, entering a code into the keypad. It slides open and reveals a locker full of gear. Guns and assorted ammunition, a decent Commlink, a few odd bits and pieces too. You pick up a few of your things, and the Commlink, and turn it it, a message pops up in the corner, and you wave a hoof to open it. "Mr. Stallion has a job for you, you're late." You sigh as you hoof it back up top to join your client. Welcome to the Canterlot sprawls, Chummer. ------------------------------------------------------------------------- Shadowrun: Equestria is a roleplaying universe set in the context of the Shadowrun Universe. In the distant future where technology and magic meet, where in Equestria, good friendship becomes rare, as everypony is motivated by money. Giant Megacorporations now own more than Governments ever could. The Princesses are still there, but their power is naught to be seen anywhere, as their superiority has been overtaken by the combination of modern technology that has sprung up in the last fifty to sixty years. Now, those unfortunate enough to be stuck on the streets face many dangers, such as gangs, random criminals, and Megacorporations. There are also anti-racial groups, and various creatures roaming free in the land. No one is safe, only safer. Megacorporation land requires you to be tracked with an embedded chip, and even then, you day job is just you slaving away at a desk job not even on minimal wage. Not a good prospect, since getting fired usually means you end up in the nearest gutter before being transferred to the morgue. The Matrix was introduced in the face of a growing population, and quickly replaced magic-mail and conventional paper. Now Ponies use "Commlinks", devices with Augmented Reality (AR) to interact with the Matrix. And to go even further, they can "jack" (the process of interfacing with a data port directly) into Virutal Reality (VR) for full sensory experience. This of course came with dangers of unexpected memory loss, fried brains, and identity issues. You are a Shadowrunner, a person who performs illegal or quasilegal ("technically" legal things) for clients and corporations, you live of money, and die by money. No matter how you got into the business, your job, is to get the work you're payed for done, and go home at the end of the day without another pony geeking you. You may be a Cyberhacker, refered to as a "Decker", for their tricked-out device called a Cyberdeck, which allows ease of hacking. You could be a street Samurai, a warrior with a code to follow as you do your grim deeds. You could be the Face of a group, a pony able to talk his or her way into places. You could even be a magician that casts magic. In this universe, the magic already exists, so the technology was a long time coming, a growth spurt of technology occurred. Although the magical arts have improved over time, ponies who once had simple projectors, carts and picked Apples with their hooves now roam around in cars and working in boring and brightly lit offices, while others live in the low-lit underground, dealing all manners of decrepit things. Extensive lore details (For the uninitiated into the Shadowrun Universe and for my, and your reference, and for those who need to understand my version of crossover Shadowrun universe) [WIP] Known AA level Corps: Known AAA Tier Corps: Armour Industries: The preferred brand of military and Corpsec soldiers, their guns can be seen used by almost everypony. And while not many can afford them, those that do love the added benefits they have over standard guns, such as an electronic bolt system, and inbuilt perks such as Smartgun systems and integrated accessories. They operate a subsidiary called Guardspony, a mercenary corporation that answers to them. Rumoured to be in good relations with SparkleTech, due to their combined R&D agreements. Appleloosa & Co: One of the biggest Corporations, their influence over Equestria is enormous, due to the fact that they are one of the few producers of agricultural goods, and they are responsible for about 70% of food distribution throughout Equestria, effectively creating a monopoly. Although someponies might say that getting Apple-related products all the time gets a little boring for the taste buds, In order to expand their business, the corporation has begun to buyout smaller A and AA tier companies in order to widen their product selection. Roleplayer details Because of the various roles that opened up with the advent of the technological age, now even other species can hold and use limited levels of magic, while Unicorn powers have increase dramatically. Only Metaponies and Changlings can pursue any form of magic, Aspected Magician and Magician being restricted to only Unicorns, while Changelings and be everything but Magicians. But here are a list of common roles: These can be played around with to create combinations (In Shadowrun, your not fixed into a single roll, and it's dependent on your skills). However, I only ask that you at the most considering of options, that multirole characters should not excel at one role, but not as well as in their secondary role. Don't take three. I will ask for you to tone it down if I think the character's abilities will restrict another's level of involvement. And yes, First come, First serve. You also get a gift pack from me, which includes: - A Basic Commlink - Extra clips (2) for your OWN weapons (Rigger gets one extra clip for drone is applicable) - A Fake SIN and License of your choice (will explain later) - One item of common rarity of your choice (if you can't decide, I'll just give you something when we get rolling) - And a message leading you to your client's location (Roleplay stimuli) Now, why inventory? Because I like to have some control at when you can and can't shoot, and the penalties for doing rash things, Yes, at times there's tons of shooty shooty, but you're supposed to be shadows. It's even in your jobs name. So I'll make some rp derpy things. Ammo clip size: 8 for Pistols, heavy pistols, Shotguns and 6 for revolvers, 14 for machine pistols 30 for Assault rifles, SMGs 100 for HMGs 5 for Rifles (Sniper Rifles, hunting rifles, etc) One for everything else. Firing modes: Single-Semi auto: Pretty much all guns. Burst: Machine pistols, ARs, SMGs, HMGs Full Auto: HMGs, SMGs, ARs I know it's not realistic, but focusing on narrative and making it easier for those who have little knowledge of Shadowrun to join. If you have knowledge of Shadowrun things, feel free to flood your inventory with that kind of stuff, or play your char accordingly. Otherwise I'll assume you have a generic <weapon>, and one of the race choices, and one of the generic a roles. Character Sheet! (AKA You application) And finally, some ground rules and extras: I am narrator, Game master(? ), and NPC master. Unless you can find some very, very proper argument and back it up with substantial evidence, my ruling is absolute and final Becareful with what you write in Character sheet. I will assume many things from it, and base my responses off yours, and your skills. While injury is highly possible, and Death is a slight possibility, I will not go overboard with descriptors. You shouldn't either. You should also act your part when downed. I ask that you put effort into your roleplay please. As I mentioned in rule 2, I will respond according to your actions. At least a paragraph. You can NOT play a DRAGON. No exceptions. Forum rules remain in effect here. At worst during combat, things will be just flat out described when it comes to pain. Again, nothing overboard. Please follow a posting order. make ONE post everytime I do, so I can tell my tale of awesomeness. Watch your back Shoot straight Conserve your ammo And NEVER deal with a Dragon Have fun, chummers! Any questions, characters and comments, please post below. GO! Yeah, if anyone needs explaining on where these various ideas come from, either talk to me or use Google if you're still absolutely lost. So hey everyone, I got a few ideas I'd like to pull out for rp. Most of these are just direct ponifications, but I'm going to try keep it so that the spilling over still remains natural to the feel of whatever is being crossed-over/ponified. 1. Warmachine/Hordes Crossover: Basic description: Warmachine/Hordes is a tabletop set in the land of the Iron Kingdoms, otherwise known as Immoren. It's a Steampunk world with elements of Fantasy and magic, where factions are contested against each other for their own causes. What I like between the two is how both Warmachine and Hordes are different in terms of their canon (Warmachine: Steampunky with magic, Hordes: Full on fantasy. ), as well GIANT STEAM ROBOTS, and GIANT FANTASY BEASTS. All in all, quite rich in exploitable content IMO. The Idea: Add some ponies, set them as freelance/mercenary ponies, bind them all together with a contract, send them off on their way, and so begins their escapade through the ponified Iron Kingdoms. Regular adventure, filled with dodging enemies, fulfilling tasks, and so forth. I honestly want to try implement a rudimentary character stat system here, just to add unpredictability. 2. Dust Warfare/Tactic Crossover. Basic description: WW2 Weird-War. Mechs, Gorillas, Zombies, Alien compounds, Jump troops. The year is 1947, and the world is literally still killing each other, the Axis are still there, the Allies broke their alliance with the USSR, who formed the Sino-Soviet Union (SSU) with China. Most WW2 elements still exist, it's just abit... sci-fi. The Idea: This kinda setting makes a good, typical NLRvsSolar Empire scenario, however, this this idea can pan out in many ways. There is nothing that speaks specifically of mercenaries who seek wealth and so forth however, so this could end quickly if everyone is on separate sides, if people are on one side however, the story could go anywhere. I'm flexible with the mechanics here, maybe as far as to leave them behind for the good old fashioned descriptive rp. 3. Shadowrun Crossover For those who don't know...: Shadowrun is a Cyberpunk Science-Fantasy game set in the 2050s (or 2070s, as is the background given in the 5th revision of it's rpg rules). In 2012, the "Awakening" brought back Magic to the world, giving rise to the usual fantasy creatures, orks, trolls, elves, etc. Since 2012, the usual cyberpunk technological advances came to, thanks to megacorporations, some which transcend national law, there is a gap between those who work for corporations, and those left to the cruel streets, where local gangs make their home. Players play as a "Shadowrunner", a guy (well, pony) who does "deniable" jobs for others, such as smuggling, killing, kidnapping, tracking, etc. The role play idea...: The way I see, this can pan out in two ways: 1. 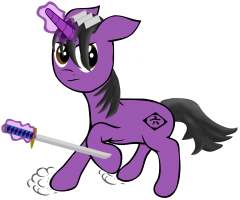 Using the traditional landscape of Equestrian, the "Shadowrunners" can be "deniable mercenaries" who work for the various ponies of Equestria. Of course, typical outright death is not allowed. Something along the lines of covert sabotage or espionage would be in order. Technology would remain same, if not the advanced tech being exclusive to the pony. 2. Bring Ponies to the context of Shadowrun, by supplanting Equestria with massive sprawls of technology (because the fantasy element already kind of exists, so the awakening in this case would be something akin to mechanical or scientific enlightenment). Iconic towns and cities such as Canterlot, Ponyville, Cloudsdale would be "modernized" in a way that fits Shadowrun context. Megacorporations and institutes could be named after certain things in the show (eg. Rainbow Factory co., Sombra Industries, Apple Family Enterprises (AFE), Celestia's School for Gifted Unicorns and Mechanics, etc). Of course, like option one, jobs will have to mellowed out as to comply with forum rules. But who says exploding buildings and covert operations (within limits ofc) are 18+ stuff. For this option, I don't mind doing it using mechanics or purely through storytelling (Got Shadowrun 5e book.) Went ahead and updated with a third option, and I'm bumping to see if anyone still wants to give these crazy ideas a shot. Reading the official IDW. comics, My Little Pony: Friendship is Magic, issue 5, you come across a character, named Maybelle, obviously she is a refrance to Mabel Pines, from Gravity Falls: So I wanted to know if you'd consider her, cannon, or crossover?